NIOS DElEd fees payment: NIOS DElEd 2nd year registrations - Online 2nd examination fee, admission fee submission open on dled.nios.ac.in. Online Submission of 2nd Examination and 2nd Year Admission Fees started at nios website. 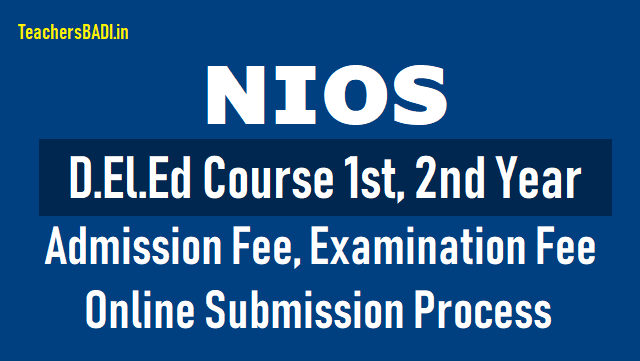 NIOS DElEd 2nd year registration for online 2nd examination, admission fee submission is open on the official website : dled.nios.ac.in. National Institute of Open Schooling, NIOS DElEd registration process for 2nd year candidates is now live. In-service untrained teachers enrolled in the NIOS D.El.Ed. programme for the 2017-19 academic session can now log on to the official website, dled.nios.ac.in and complete the online submission of 2nd examination and 2nd year admission fees, steps and direct links for the same have been given below. The second examination of Diploma in Elementary Education, DElEd would be conducted in the month of September. Due to devastating flood hit Kerala State, NIOS has decided to accept the offline Admission form & late fee exemption of Admission/Examination.Learners whose board exam documents have been lost/damaged in the floods,will be provided the same without any charge on request basis. 1. All Question Papers will be bi-lingual i.e English and Hindi; and selected Regional Language. However the learners are allowed to write the answer in any one language (except language paper) included in the eighth schedule of the Indian Constitution. The learner has to write the medium/language of answering questions on the specified space in the Answer Book. The Fees can be deposited till 15th October, 2018. Online Submission of 2nd Examination and 2nd Year Admission Fees started. 2nd Year Fee Submission is compulsory for all D.El.Ed. Learners enrolled with NIOS. Unsuccessful/ABSENT Learners in the 1st Exam will appear in the next exam of 1st Year with due registration for Exam after declaration of Results. Such Teachers also need to pay the 2nd Year Fee. All D.El.ED. Learners registered with NIOS are required to submit Registration Fee for 2nd year. Visit http://dled.nios.ac.in. DO NOT WAIT for Last Date. Deposit 2nd Year Fee at the earliest. a. Examination Fee: The examination fee is Rs 250 for each course. The second examination fee can be paid by July 31st. b. Registration Fee: The total registration fee for 2nd Year Admission is Rs 6,000. Last date for second year Admission fee submission is July 7. Step 1: Log on to dled.nios.ac.in. Step 4: Enter Enrollment number and hit Submit. Step 5: Select medium, enter the needful details and proceed to online payment. Step 6: Take a print of the payment receipt, once the payment is successful. Step 7: Check the application status by entering the enrollment number into the portal again. Process for Online Submission of Examination Fees. Process for Online Submission of II Year Registration Fees. teachers working in primary/ upper primary schools in different parts of the country. 2nd June 2018 (503), can now apply for the examination for subject code 501, 502 and 503 along with registration fee for Second examination i.e. 504 and 505 to be held in the month of September, 2018. The total examination fee to be paid for the 05 subjects will be Rs. 1250/- (Rs. 250 x 5 subjects). 2. D.E1.Ed. learners who have already registered/appeared for the subjects on 31st May (501), 1st June (502) and 2nd June 2018 (503), may only apply and appear in the examination for the subjects code 504 and 505. A fee of Rs.500/- will have to be paid by each examinee to appear for 504 and 505. 3. D.E1.Ed. learners who have already registered/appeared in the First Examination i.e. 31st May (501), 1st June (502) and 2nd June (503), and may be unsuccessful or absent in any of the subject in the examination, will be given opportunity to apply after the declaration of result of the First Examination to again register for the subjects code 501, 502 and 503 for the examinations to be held in the month of September, 2018. A ten (10) days time for submission of examination fee would be provided to such untrained teachers after declaration of result of the First Examination. The schedule for Serial No. (1) and (2) registration for the Second Examination of D.E1.Ed would be from 1st July 2018 to 31st July 2018.